Sts. 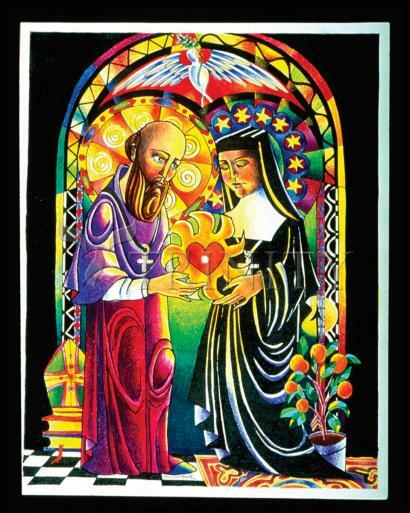 Francis de Sales and Jane Frances de Chantal had a deep and beautiful relationship, a true friendship of souls. Was born in a castle to a well-placed family, his parents intended that he become a lawyer, enter politics, and carry on the family line and power. He studied at La Roche, Annecy, Clermont College in Paris, and law at the University of Padua. Doctor of Law. He returned home, and found a position as Senate advocate. It was at this point that he received a message telling him to "Leave all and follow Me." He took this as a call to the priesthood, a move his family fiercely opposed. However, he pursued a devoted prayer life, and his gentle ways won over the family. Francis was a priest and Provost of the diocese of Geneva, Switzerland, a stronghold of Calvinists. He was a preacher, writer and spiritual director in the district of Chablais. His simple, clear explanations of Catholic doctrine, and his gentle way with everyone, brought many back to the Roman Church. Francis became Bishop of Geneva at age 35. He traveled and evangelized throughout the Duchy of Savoy, working with children whenever he could. He was a friend of Saint Vincent de Paul. He helped found the Order of the Visitation with Saint Jane de Chantal. He was aprolific correspondent and a Doctor of the Church. Was born to the nobility, the daughter of the president of the Parliment of Burgundy who raised her alone after the death of her mother when Jeanne was 18 months old. She married in 1592 at age twenty to Baron de Chantal and became a Mother of four. Jane was widowed at 28 when the Baron was killed in a hunting accident and died in her arms. Taking a personal vow of chastity, she was forced to live with her father-in-law, which was a period of misery for her. She spent her free time in prayer, and received a vision of the man who would become her spiritual director. In Lent, 1604, she met Saint Francis de Sales, and recognized him as the man in her vision. She became a spiritual student and close friend of Saint Francis, and the two carried on a lengthy correspondence for years. On Trinity Sunday, 6 June 1610 she founded the Order of the Visitation of Our Lady at Annecy, France. The Order was designed for widows and laywomen who did not wish the full life of the orders, and oversaw the founding of 69 convents. Jeanne spent the rest of her days overseeing the Order, and acting as spiritual advisor to any who desired her wisdom. Visitationist nuns today live a contemplative life, work for women with poor health and widows, and sometimes run schools. "I do not say that one should not aspire to these high and extreme virtues, but I say that one must exercise oneself in the little ones, without which the great ones are often false and deceitful. Let us learn to suffer voluntarily words of abasement and words that serve to snub our opinions and our views; then we will learn to suffer martyrdom, annihilation in God, and insensibility in all things."